>> 144 teams have used 145 or more starts. >> 47 teams have used 110 or fewer starts. >> 12 teams have made 200+ moves. >> 57 teams have made 100 - 199 moves. >> 320 teams have made 26 - 99 moves. >> 123 teams have made 10 - 25 moves. >> 13 teams have made 0 moves. >> 160 teams have used 150 or more starts. >> 57 teams have used 115 or fewer starts. >> 14 teams have made 200+ moves. >> 62 teams have made 100 - 199 moves. >> 118 teams have made 10 - 25 moves. >> 176 teams have used 155 or more starts. >> 54 teams have used 120 or fewer starts. >> 17 teams have made 200+ moves. >> 68 teams have made 100 - 199 moves. >> 313 teams have made 26 - 99 moves. >> 114 teams have made 10 - 25 moves. >> 149 teams have used 165 or more starts. >> 68 teams have used 130 or fewer starts. >> 21 teams have made 200+ moves. >> 73 teams have made 100 - 199 moves. >> 311 teams have made 26 - 99 moves. >> 107 teams have made 10 - 25 moves. 814 moves...how is that even possible??? That's gotta be like 7+ moves per day. Is he turning his entire pitching staff over every day? A lot of it is pitchers, but he also picks someone up, does more research and drops that player for someone else, then decides to grab that first player and drop a different one, etc, etc. So, many pickups never make it into his lineup. >> 66 teams have fewer than 10 starts remaining. >> 69 teams have 40 or more starts remaining. >> 27 teams have made 200+ moves. >> 80 teams have made 100 - 199 moves. >> 301 teams have made 26 - 99 moves. >> 104 teams have made 10 - 25 moves. >> 81 teams have 30 or more starts remaining. >> 11 teams are below the minimum innings pace. Teams that do not reach 1000 IP will be scored as last in ERA and WHIP. The Funhouse	(EXPERTS)	923.1 IP >> Currently just on pace, but Mastersball Carey could gain 1 point if they fall short of the 1000 IP. The Clear and The Cream	(Baseball Reasons)	915.1 >> Leaders would not gain any points. Trolley Dodgers	(Cust Kayin')	913 >> 1st place Higgins (Gobias Industries) could gain 1 point. 7 Words	(RCL 16)	876.1 >> Leaders would not gain any points. 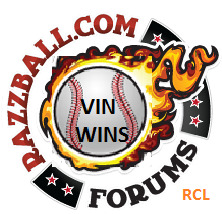 SG Sox	(RCL 33)	870.1 >> 2nd place (2 behind) royce! (San Diego Chippers) could gain 2 points, though he could also pass SG Sox in ERA and WHIP before the season ends. Coffey's Cutlets	(Toads n Wet Rocks)	860.2 >> Leaders would not gain any points. Team Frazer	(RAZZBALL ROTO LEAGUE) 851.1 >> All teams would gain 2 points as Team Frazier is first in both categories. Team Tele	832.1, - 7 Words	725.2 (RCL 15) >> 2nd place (10.5 behind) The Good The Vlad The Utley could gain 2 points. Team Michael	(RCL 46)	790.1 >> Already last in both categories. I94 Series	(RCL 13)	777 >> 2nd place (10.5 behind) Tobias Fünke's NeverNude Dudes could gain 1 point. Dr. Toboggan's Magnum Dongs	(RCL 20)	665.2 >> 1st place Barry Bonds (2.5 ahead) could gain 1 point. >> 30 teams have made 200+ moves. >> 82 teams have made 100 - 199 moves. >> 298 teams have made 26 - 99 moves. >> 102 teams have made 10 - 25 moves. >> 97 teams have 20 or more starts remaining. >> 12 teams are below the minimum innings pace. Teams that do not reach 1000 IP will be scored as last in ERA and WHIP. The Funhouse	(EXPERTS)	945 IP >> Mastersball Carey could gain 1 point. The Clear and The Cream	(Baseball Reasons)	940 >> Leaders would not gain any points. Trolley Dodgers	(Cust Kayin')	937.1 >> 1st place Higgins (Gobias Industries)(1 ahead) could gain 1 point. 7 Words	(RCL 16)	902 >> Leaders would not gain any points. SG Sox	(RCL 33)	907 >> 2nd place (0.5 behind) royce! (San Diego Chippers) would gain 2 points. Coffey's Cutlets	(Toads n Wet Rocks)	882.2 >> Leaders would not gain any points. Team Tele	877.1 - 7 Words	742.2 (RCL 15) >> 2nd place (11 behind) The Good The Vlad The Utley could gain 1 point. Team Michael	(RCL 46)	821.1 >> Already last in both categories. I94 Series	(RCL 13)	813 >> 2 leaders would each gain 1 point. Dr. Toboggan's Magnum Dongs	(RCL 20)	686 >> 1st place Barry Bonds (2 ahead) could gain 1 point. >> 33 teams have made 200+ moves. >> 95 teams have made 100 - 199 moves. >> 282 teams have made 26 - 99 moves.